We've made some big changes at IMPACT in the last year, and the one we're most excited to share is our transition to Agile Marketing using Scrum. We made the switch in August of 2016 after working with an Agile Marketing consultant, Mark Long. Mark helped us decide how to structure our teams, how to change our pricing model, and how to train our teams -- and after only one month of training, our agency flipped and never looked back. You've probably heard a lot of talk about Agile Marketing but still aren't quite sure how to get started. We did a ton of research initially, and we noticed that most of the content out there only covers Agile Marketing in theory without explaining how a leader could actually use it for their team. In this article, I'm going to share everything you need to know to adopt Agile Marketing in your organization. This is the roadmap we wish we had a year ago! Agile Marketing is a marketing approach inspired by the values and principles of Agile software development. Agile was developed in the 90s in response to the frustrating lag time between businesses requesting certain applications or features and the launch of technology that addressed those needs. Software developers weren't quick enough to keep up with changing demands. Right now, marketing is going through its own Agile renaissance in response to rapidly changing markets. Media is evolving quickly and media consumption changes often. Annual marketing plans simply don't get the job done anymore. Too much can change in one year for even the most well-thought plan to remain relevant. Plus, data provides more insights and is more accessible than ever before. We're at the point where speed and agility in marketing is not only possible -- it's practical. Take a look at how marketers have adapted the Agile Software Development principles for Agile Marketing. These values make sense, but they are dramatically different than traditional marketing methodology. Scrum takes the Agile principles and adds a layer of structure. The goal is to empower teams to solve complex problems in less time and ultimately, create more value. Scrum is a lightweight project management framework that focuses on "getting out of the way" of marketers getting the job done, while still providing visibility to the team and to management. Scrum has its own terminology, so first you want to get familiar with the lingo to make everything make sense going forward. The 3x3 approach is a term used to describe the key elements of Scrum implementation: 3 artifacts, 3 roles, and 3 ceremonies. First of all, there are three primary documents (or artifacts) you will use in Agile Marketing. As you might expect, there are software options available to help you create and manage these artifacts, but we'll get into that later. 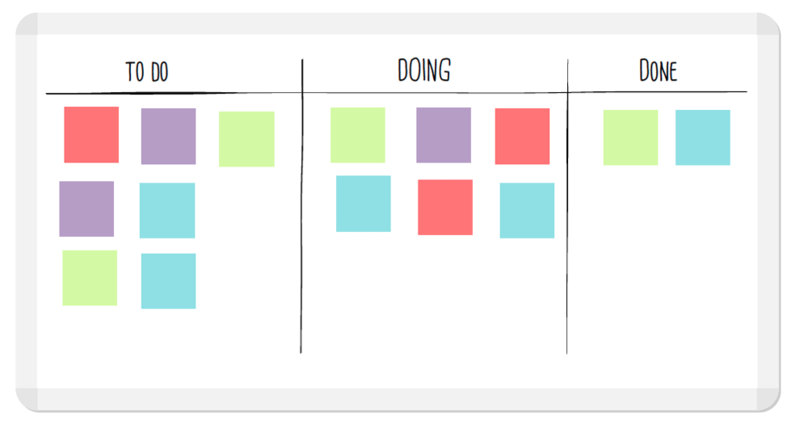 The product backlog is a prioritized queue of work items that the product owner may ask the team to work on in the next sprint. The product owner (see the next section) maintains and updates the product backlog frequently to ensure priorities are always kept in order. The sprint backlog organizes all of the work items that your team has committed to working on during the current sprint. The tasks in the sprint backlog are all agreed upon in the sprint planning meeting. The burndown chart is a visual representation of your team's progress in the current sprint. Everyone should review the burndown chart daily to ensure the team is on track to meet commitment. There are three primary roles in Agile Marketing, all autonomous, cross-functional, self-organizing, and collectively responsible. The product owner is responsible for planning the work. They own the backlog, which is basically a list tracking the tasks and progress of every project. As the owner of the backlog, the product owner is responsible for setting the priorities for the team and represents your customers, approaching every task with your customers' best interests in mind. They accept or reject the work on behalf of your customers. The implementer is the team member responsible for executing the work at hand. They can organize themselves and do the work the best way they see fit, and as long as the work gets done right and on time, the implementer maintains full autonomy. This is important because it frees managers up from having to supervise team members and also makes your organization more attractive to young, hungry marketers who don't want to be micro-managed. The scrum master is primarily responsible for enabling the team to execute. They are the team leader, but that doesn't necessarily mean they are a manager -- they simply have the personality to lead a project and create harmony among groups of people. The scrum master facilitates Scrum ceremonies (which we'll get into next) and helps address and eliminate any challenges (or impediments) that may prevent the team from completing their tasks. They also assist the product owner with planning. Think of the scrum master as a servant leader. Daily scrums are short meetings that keep everyone up to date on where the team's progress stands. The point is to get in, address any pressing issues, and then get back to work. What did you accomplish yesterday to move the team closer to sprint commitment? What do you commit to accomplishing today? In-depth conversations are saved for another time outside of the daily scrum. It's important to not go over the 15 minutes because wasting time defeats the entire purpose of Agile Marketing. If one or more implementers are facing impediments, they can discuss their scenario with the scrum master after the meeting to find a solution without holding everyone else up. Many companies, like IMPACT, refer to these meetings as "stand-ups." They get their name from the fact that participants are encouraged to stand for the entire meeting, to help keep it limited to the 15-minute slot. In sprint planning, the product owner communicates the top priorities of the sprint to the implementers, so they are clear on what they need to accomplish and in what order. During this time, the product owner and implementers will discuss all of the tasks at hand to make sure everyone fully understands the goals and scopes of the sprint. It's also important that implementers understand the value they are creating so they know why their work matters. After discussing the details with the product owner, the implementers will commit to a specific set of work that they can realistically complete by the end of the sprint. This is the meeting your team will have at the end of a sprint to review what was accomplished, what, if anything, wasn't, and to reflect on what you could do differently. The first step is to review how many stories completed and whether or not the team met their commitments. By the time you have this meeting, you should already have a clear idea of where everyone is at with their tasks, but it's helpful to sit down and review everything as a group. Plus, it's motivating to see how much you have accomplished in a short time. The retrospective part of this meeting focuses on identifying what the team did well and what they didn't do well. Based on that information, your team should come up with suggestions and action items for what to change moving forward to increase your success. The idea is to think bigger than what makes your team more effective, but also how can you be more effective and happier with the work? At the end of this meeting, the team must identify at least one impediment that slowed the team down, as well as an actionable improvement that will be made in the following sprint. Alright, now that you are familiar with all of the terminology, we can get to the good stuff -- how you can actually get started with Agile Marketing. A common misconception about Agile Marketing is that planning is completely thrown out the window. The truth is we still do planning; we are just more flexible about changing or adapting those plans as new information or impediments present themselves. The following planning mechanisms should be decided upon within the team. Your roadmap focuses on the big picture. These are the most critical goals for your organization. To create your roadmap, the stakeholders in your company need to communicate their vision and what they believe your team should accomplish in a year. They should clearly define the objectives and metrics of success to ensure everyone is aligned on what the big picture looks like. The roadmap should also articulate the high-level strategy to achieve your objectives. Don't worry about specific tactics in the roadmap because those will change -- think purely strategic. You can choose a planning horizon that works best for your organization, but the roadmap typically plans for at least 6-12 months. However, that still doesn't mean these plans will be set in stone. Your team should evaluate and update your roadmap every quarter to reflect new information, changing trends, unforeseen problems or opportunities, changes in priorities, and anything else that affects how your business operates. 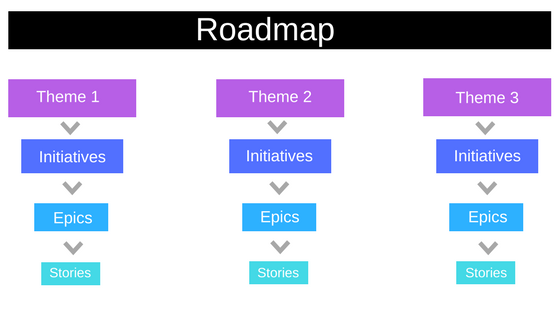 The roadmap is the most important artifact for your internal stakeholders, and they should be included in the planning and review processes to ensure everything reflects their strategy. Themes act as the guardrails of your strategy, helping you prioritize tasks based on how you are performing against your goals. Theme specify how resources will be allocated and should be periodically rebalanced, like you would do with an investment portfolio. The percentages essentially specify how much of the team's effort will be allocated to each theme based on your goals. If you need X number of leads, and your traffic and sales conversion are strong, you will weight the leads theme much higher. Instead of having your content writer work on 10 blog articles, you have the guardrails in place to know you should instead focus their time on creating an eBook for conversions. Next quarter when you re-evaluate, let's say your conversion rate went up but your sales didn't. You may then rebalance the percentages to put more effort into improving your sales metrics. Your roadmap also consists of a number of strategic initiatives which are essentially a collection of tactics to execute the strategy. You can consider thinking of each initiative as its own campaign and they may include website redesign projects, content marketing campaigns, or social media campaigns. The planning horizon for initiatives is typically 1-3 months. Most of your marketing tactics are represented by an epic. An epic is period or project that produces a deliverable product with a defined business value. For example, a new landing page design that increases conversion rates by 200%. The planning horizon for epics is typically a month or less. Epics are broken down into stories, which are specific tasks that implementers will complete during the sprint. Each story is specific to a set of tasks. At IMPACT, we don't break it down past stories. We let our implementers take responsibility for how to get a story done. We have created a set of "playbooks" that document common story processes for efficiency and quality control, but we don't track every little task in a project management system. Beyond a story, it becomes tedious without adding value. There are three primary roles that we discussed earlier -- product owner, scrum master, and implementer. In most cases, your product owner will be the CMO or Director of Marketing. Whoever the product owner is, they need to be present daily to review the work of the team and accept that it’s “done” according to the original strategy. Your scrum master will be someone you feel qualified to lead scrum ceremonies and keep everything running smoothly. For most organizations, the scrum master will be an implementer that excels in organization and knows how to get things done. The scrum master typically isn't a manager -- they are a peer who is passionate about removing obstacles for the team. Last, but not least, implementers, depending on your existing team and their skill sets, are the most difficult roles to fill. You probably already have people on your team with certain specialties that can flow right into scrum and accomplish the stories relevant to their skills with no problem. However, the challenge for many team members will be the concept of being cross-functional, which means they might have to break outside of their specialty to help the team meet the sprint committment. The scrum team is responsible for all of the work, so if your content creator has too much on their plate, a designer (or someone else) should be able to step in and help them complete all of their tasks. People prefer to do the work they are most comfortable with, so it not everyone will be a fan of this approach, but the goal is to work towards completing all of the tasks together. The best way to get implementers on board with Agile Marketing is to hire T-shaped employees who are more adaptable in the first place. This graphic from Moz illustrates the concept perfectly. A T-shaped implementor specializes in one area, but still has enough knowledge to accomplish a variety of tasks in other areas if needed. Hiring T-shaped people is one of the most important things you can do to thrive with Agile Marketing. Due to the short timeframe, there is a limit to what you can accomplish during your sprint. In order to plan out your sprints accurately, you will assign "story points" to each task to give you an idea of how many stories you can expect to complete during the sprint. Story points are closely related to time, but not exactly. In other words, one story point is not equal to one hour, but the concept is the same in that two story points takes about twice as much time as one story point. You can use hours instead of story points, but we find story points more effective because in addition to time, they also consider the relative difficulty or technicality of a story. To ensure your team stays productive without burning out, you have to consider the time and energy investment of each story. Some use the Fibonacci sequence to estimate how long it will take to complete a story. The Fibonacci sequence gets progressively bigger with each addition of a new task because you are adding the two previous quantities together, e.g. 1, 2, 3, 5, 8, 13, 21, 34. At IMPACT, we have a service catalog of common epics with pre-scoped points that allows us to predict how much we can fit in a sprint. This is something you will have to test and adjust with a few sprints before you can expect to have your point system nailed down, but I'd highly suggest doing the same. For more custom, non-everyday stories, the team of implementers decides on the story points of work -- not the sole project manager who may not know all the intricacies of actually getting the work done. Again, how the work is actually completed is totally in the hands of the implementers. Ultimately, our goal here is to get all of the work done in half the time with 10x the quality -- so figuring out your workflow is important. The first thing you want to decide is how long your sprints will be. At IMPACT, both our internal and client sprints are one week long. We have found this to be just the right amount of time for all-out work without risking burn-out. I should note we are considering changing this to two weeks, but hey, that's the beauty of Agile. We're continually figuring out what works best for the team. Another important consideration is your definition of "done." Your product owner should clearly define what a story has to look like to be considered done with acceptance criteria. With this in hand, your team understands the vision of the story and what the final product should look like on a strategic level. At IMPACT we have a two-step review process for our clients. The initial implementer completes the story, then they pass it to another implementer to internally review it. If that reviewer notes that everything is complete, they pass it to the product owner to review from a strategic perspective. Only the product owner can call something done -- this ensures we produce the highest quality work. The internal reviewer makes sure everything was set up correctly from a technical standpoint, reviews the copy for errors, and ensures everything was done properly. Once done, they pass it to the product owner. The product owner reviews the landing page to ensure the copy and images are on message and will perform the job of assisting in conversions. If so, they mark it done and it’s ready to be put to use. *Bonus tip: We completely outline what has to happen when building a landing page in a playbook so the implementer does not have to think about how to do it, and we simultaneously remain consistency no matter who steps in to do the work. It's important to note, however, while we have these processes in place, we continually analyze our workflow to build on efficiencies and to eliminate inefficiencies. If something is getting passed back to the original implementer over and over again, we identify the issue in our retrospective and solve it. This process allows us to get stories done more efficiently without sacrificing quality. For most organizations, Agile Marketing will be a significant change that makes a lot of people uncomfortable. Trust me, it took some getting used to here. It's totally normal and expected, but it's not something that should prevent you from going Agile. Nothing that's actually worth your time, comes easily. Now, the first thing you should do is have everyone on your team read Hacking Marketing by Scott Brinker (or have them start with this article) so they can familliarize themselves with the basic concepts of Agile Marketing and know what to expect. Scrum Crash Course -- a session that discusses the 3x3 approach in more detail. We also had most of the team read “Scrum” by Jeff Sutherland. Software Training -- we gave the team a full training session on how we set up the software, our product owners, the strategists on each team, and had specific training on how to upload stories and keep the backlog groomed. Agile Marketing is a mindset more than anything else. You need to have an office and company culture of freedom, responsibility, and trust that encourages it. Each person has the autonomy to do the work however they want, but they still have to be responsible about getting it done on time and at a high quality. You want to encourage healthy criticism so that everyone knows they can trust others to be honest with their feedback. A big part of an Agile culture is the attitude that we don't know everything and we are always going to keep improving. And just as important, an Agile culture aims to keep people happy so they actually enjoy their work. I saved this for last because one of the key principles of Agile Marketing is not letting your software dictate your workflow. You shouldn't even bother comparing software until you know exactly what you want to implement -- that way you can find the best solution for your specific needs. At IMPACT, we use JIRA because it fits perfectly with our workflow. First, you want to build out your planning mechanisms -- roadmap, themes, initiatives, epics, and stories. Then you should create your backlog and if you don't already know, you should assign the three roles to the appropriate people in your team. Next, schedule your daily scrums, backlog grooming, sprint planning, and retrospective sessions. IMPACT teams sometimes do their backlog grooming the day before so they’re not rushed while some do their grooming an hour before the planning session so they know exactly what is going to be complete. Now that you have everything planned out, it’s time to take the training wheels off. At IMPACT, we had the leadership team try scrum and our new software before rolling it out to the entire company. After some testing and adjusting, we started training the rest of the team. Then, once everyone was ready to go, we launched our first successful sprint and it went surprisingly well. If you're a smaller team, we suggest you dive in and plan for extended retrospectives the first few weeks to work through any challenges the team faces. It took IMPACT about eight sprints to become pretty self-sufficient. Iteration happens throughout the entire process. As you implement scrum for your team, each review and retrospective should identify items to improve upon. Remember -- Agile is a practice of never-ending improvement, so there is no pressure to get it right on the first try. IMPACT has continued to evolve and we still don’t have all the answers, but that’s okay! We never did, but now we have a structure in place to make improvements more quickly and the team has never been stronger. There is a lot to take in from this article, so let's take a minute to recap. There is no other approach to marketing that we know of that is better suited for today's business climate than Agile Marketing. Going Agile has improved IMPACT in every aspect from the value we deliver our clients and the revenue we generate to the way we interact and work together as a team. You Can't Be An Agile Marketer Without This One Tool.